The Carolift 40 is a versatile wheelchair hoist that can be used to pick up a wheelchair or rollator directly from the pavement. 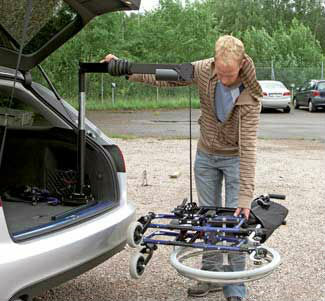 This is perfect for taking out the manual labour in packing away wheelchairs and fitting them in the boot. The Carolift 40 is able to be fitted in a wide variety of small vehicles and sedans. With the Carolift 40, packing wheelchairs is simple and easy. With the wheelchair next to the vehicle, just attach the docking device and push the UP button to raise it above the bottom of the door opening. Then, simply swing the lift arm into the vehicle and push the DOWN button – it’s as simple as that! The arm of the Carolift 40 is articulated both ways, providing an almost endless variety of positions. This feature makes installation possible in vehicles with narrow rear openings and snug compartments. The flexible arm and flexible mounting base makes the Carolift 40 an excellent choice for sedans or estate cars with a sloping and low rear door. The hoist can lift most manual wheelchairs as it can lift wheelchairs that weigh up to 40kg. The lift is electrically operated using the cars own battery. Once the mobility device is stored inside the vehicle the entire hoist can be folded to the floor to keep a clear back view. The hoist is detachable and easy to remove from its mounting base by merely lifting up the arm. This provides you with extra flexibility in the case that you require more space in the boot.